BEVERLEA WALZ PHOTO Brrr! A bracing Turkey Plunge last November. A round-up of Shelter Island events and activities for the week of November 15, 2018. BEVERLEA WALZ PHOTO The Friends of the Library 9th Annual Turkey Plunge will take place on Saturday, November 24, at 11 a.m.
Activities and events for the week of November 8, 2018. 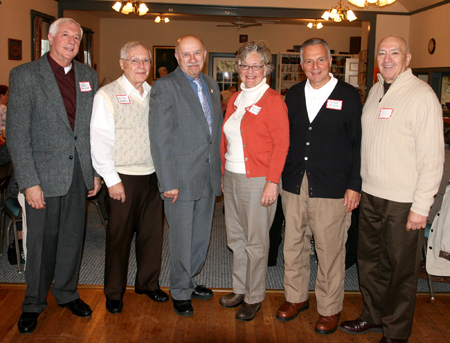 BEVERLEA WALZ PHOTO | Special guests at SISCA’s Ecumenical Breakfast were, from the left, Father James Cardone, Reverend Tom Charls, Reverend Alan Krauss, Reverend Anne Stewart Miller, Father Peter DeSanctis and Julius Manchise. A joyful spirit was not on the menu at last Thursday’s Ecumenical Breakfast but it was abundantly present as SISCA members, their guests and invited clergy gathered in the Presbyterian Church’s Fellowship Hall for this traditional November feast. By 10:15, SISCA Vice President Gert Bourne had checked off some 50 names on the sign-up sheets, including the clergy. President Emily Hallman took a few moments to introduce a motion to re-elect the current officers, with the exception of the secretary, to serve in 2012. It passed unanimously. Ms. Hallman will remain president; Gert Bourne, vice president; Ginny Rowland, treasurer; and Charlotte Hannabury and Ceil Kraus, program co-chairs. Joan Belaval will come on board as secretary. Following the business meeting, Ms. Hallman introduced the Reverend Anne Stewart Miller, the recently appointed interim pastor of the Shelter Island Presbyterian Church. She is a strikingly handsome woman with a strong voice and an air of quiet authority. Angela Corbett, a distinguished chef on loan from the Nutrition Program’s Dinner Bell, was poised at the buffet table, ready to serve the scrambled eggs while guests helped themselves to bacon, sausage, waffles, French toast sticks, fresh fruit, bagels, croissants and miniature Danish pastries. Please note, the Sylvester Manor Farm had donated the 95 eggs to be scrambled. A newcomer, Father James Cardone, took about 60 seconds to describe his ecumenical upbringing and background. He is a retired Episcopal priest and a very funny man. Father Peter DeSanctis of Our Lady of the Isle Roman Catholic Church was the last to speak. He has a robust tenor voice and led us in a rousing rendition of “You Are My Sunshine,” to mark the passing of Joan Misciagna, a much-beloved cafeteria and playground aide at the Shelter Island School. Abundance was indeed the overriding theme of this year’s Ecumenical Breakfast — an abundance of food, of joy and thoughts to contemplate tomorrow, Thanksgiving Day.